Halloween parties are expected, yet a Game of Thrones theme is a surprise to most. Get attendees thinking about the continents of Essos and Westeros; have them dress appropriately, prepare for war games and more at your Halloween party. The show borrows costume inspiration from Japanese and Persian culture. Not just any medieval or swashbuckler garb will make the cut. 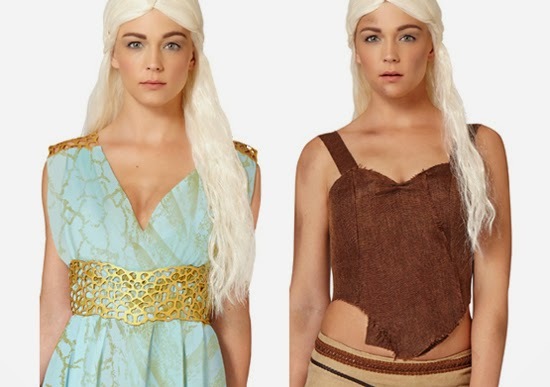 A Daenerys Qarth costume or other choice associated to the actual characters and show is more like it. For décor, think votives, red tablecloths, model dragons, and glass decanters. Serve finger foods on gold colored plates and pour drinks into goblet shaped cups. Opt for candles over bulbs for lighting. And, rather than paintings, adorn the walls with family-aligned banners and flags. Keep the dining simple yet delectable, serving an assortment of bread, wine, and cheeses. Top off the offering of foods with meatballs and porkpies fit for a king and queen. No party ambiance is complete without sounds. The complete Game of Thrones soundtrack is available online for download or at your local music vendor. Make sounds loud, front, and center during games, or turn them down while eating dinner. Ask certain guests to dress and act like a character on the show. For added entertainment, hire an actor to make a guest appearance at the party. Halloween is a time to suspend reality and adopt foreign personalities. Add a layer of suspension by hiring a professional entertainer. Get DVDs or stream Game of Thrones content from your computer during the party. Rather play on the television, buy or rent a projector and pull-down movie screen. Have attendees gather around inside or assemble on the front or back lawn for a movie picnic. Rally the troops and get them excited for the party. Start a Facebook page dedicated to the event. Post décor pictures, suggest places to buy costumes, and feature recipes of libations and desserts. There’s no Internet within a Dolthraki tent, yet there’s zero reason not to use it to your GoT party’s advantage. Each party element needs address. Make cupcakes with winter forest icing and bake dragon egg-shaped cookies to fill the bellies of hungry partygoers. Add green food dye to clear soda to make ‘dragon potion.’ Ask for other ideas from your Facebook page members and advocates! Bows and arrows are the preferred weaponry of warriors on the show, so have guests take a stab at archery. Buy a number of toy bows and arrows to host an archery tournament in your backyard. Game of Thrones is one of the hottest shows on television; everybody is talking about what’s going to happen next. Make sure people talk about your upcoming party. Deck the walls with flags and banners; build tents for an outdoor DVD showing; and, prepare your backyard for an archery tournament. Richard Mills is a die hard Game of Thrones enthusiast and fan. He also loves a good Halloween bash. He enjoys sharing his ideas online through blogging.